The Arizona Wilderness Coalition's award-winning Wilderness Stewardship Program is a volunteer-based program, formed in 2010, to assist the U.S. Forest Service with activities to maintain, protect, and restore the character of wilderness areas on Arizona's national forests. Initially launched on the Prescott National Forest, the popularity and success of the program has allowed us to continue working on the Prescott and include projects on Arizona's other national forests as well. The goal of our Wilderness Stewardship Program is to empower Arizona’s communities and volunteers with in-depth training, resources, and logistical support in order to monitor and restore wilderness areas across the public domain. As part of the U.S. Forest Service’s 10-year Wilderness Stewardship Challenge, AWC has partnered with the Prescott National Forest and the National Forest Foundation to address pressing issues that face our wilderness areas in light of increased visitation, decreased federal resources, and magnified ecological impacts such as invasive species. The program, which will train dedicated volunteers as long-term “stewards,” will also engage short-term volunteers on a weekend basis. 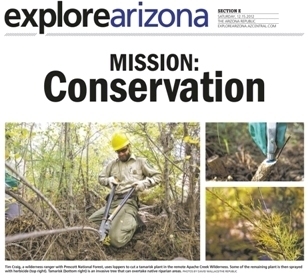 Watch an azcentral.com video about our fall trip (2012) to remove invasive tamarisk in Apache Creek Wilderness. Read about one of our newest volunteers, who will serve as AWC's first Wilderness Steward for a Wild & Scenic River. Read an article about a local volunteer from Phoenix who takes part in Wild Stew trips about 4 times a year. 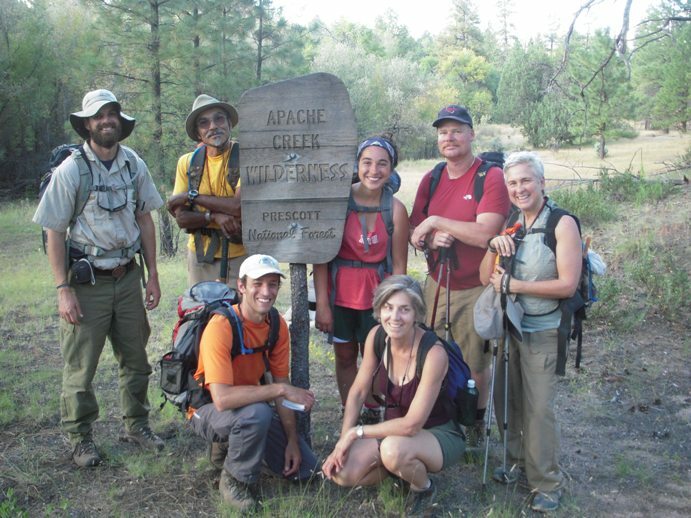 Volunteers can participate in AWC-led events as their schedules permit, or take a more involved role in the program by "adopting" a wilderness area or wilderness trails as an Individual Wilderness Steward. Activities include various trail maintenance and improvement projects, hiking or horseback riding trails, social interactions with other outdoor enthusiasts, and gaining general knowledge on a host of natural topics such as wildlife, geography, public lands, and plant identification. Volunteers interested in helping with other general support activities, such as adminsitrative duties, are encouraged to get involved. No experience necessary to participate! Check out our list of volunteer opportunities here. Becoming a Wilderness Steward is a great way to spend more time in our wilderness areas, interact with other outdoor enthusiasts, and contribute to protecting our wonderful public lands here in Arizona. For more information, email us or call 928-350-2204. Interested in volunteering with AWC? Check out our latest volunteer field schedule here. Our training events are a great way to develop your skillset and work towards becoming a steward able to adopt a Wilderness area.